BioBeads are a blend of 4 probiotic strains: Lactobacilus acidophilus, Bifidobacterium bifidum, Bifidobacterium longum, Lactobacilus rhamnosus that have been encapsulated in a protective bead. The bead encapsulation protects the probiotic strains from digestive juices so that more of the probiotic bacteria can make it into the colon. The dosage of probiotic is 1 billion cells per bead. BioBeads do not come with prebiotic. BioBeads have no dyes, artificial ingredients, or dangerous ingredients we are aware of. Natrol BioBeads has 1 billion CFUs in 4 strains. It is protected by a bead but does not come with a prebiotic. Prebiotics Prebiotics are a food source for probiotics. Natrol BioBeads do not come with prebiotic. Number of Probiotic Strains There are thousands of different kinds of organisms living in your colon. Some are more helpful than others. Some probiotic organisms are more helpful that others. Natrol Biobeads have 4 strains. Number of CFUs (in billions) CFU stands for Colony Forming Unit which is representative of the number of organisms in the product. Natrol BioBeads have 1 billion CFU for 4 strains. Enteric Coating Digestive juices may destroy many probiotic organisms. An enteric coating or delayed-release system that releases probiotics in the colon may help keep them alive. 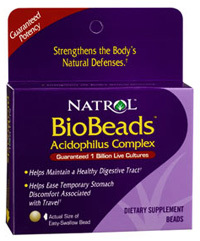 Natrol BioBeads are protected as the probiotics are encapsulated in beads. No artificial coloring or dyes Natrol BioBeads do not have any artificial dyes or coloring.